The following questions and answers address issues relating to international humanitarian law (the laws of war) governing the current conflict between Israel and Hamas to date in Gaza. Due to security concerns and limitations on access, Human Rights Watch has not yet undertaken a significant on-the-ground investigation in Gaza. The purpose here is to provide analytic guidance for those who are examining the fighting, as well as for the parties to the conflict and those with the capacity to influence them. This Q & A focuses on international law governing the conduct of hostilities by each party to the conflict. It does not address whether Hamas or Israel was justified in its attacks, or other matters concerning the legitimacy of resorting to war. In accordance with its institutional mandate, Human Rights Watch maintains a position of neutrality on these issues of jus ad bellum (law concerning acceptable justifications to use armed force), because we believe it is the best way to promote our primary goal of encouraging all sides in armed conflicts to respect international humanitarian law, or jus in bello (law concerning acceptable conduct in war). What international humanitarian law applies to the current conflict between Israel and Hamas? Who is subject to military attack? What are the obligations of Israel and Hamas with respect to fighting in populated areas? Should belligerent parties give warnings to civilians in advance of attacks? What constitutes an "effective" warning? May Israel lawfully attack police stations and police personnel in Gaza? May Israel attack mosques in Gaza? Is Hamas's firing of rockets at Israel lawful? Is it lawful to target leaders of Hamas and their offices and homes? May Israel attack Hamas radio and television stations? Is Israel's blockade of Gaza lawful? What are Israel's and Hamas's obligations to humanitarian agencies? Who can be held responsible for violations of international humanitarian law? The current armed conflict between Israel and Hamas and other Palestinian armed groups is governed by international treaty as well as the rules of customary international humanitarian law. The treaty law, most importantly Common Article 3 to the Geneva Conventions of 1949, to which Israel is a party, sets forth minimum standards for all parties to a non-international armed conflict - that is, between a state and a non-state armed group. Also relevant is law on occupation found in the Fourth Geneva Convention of 1949, which remains applicable in Gaza because of Israel's ongoing control of many aspects of life there despite the withdrawal of its troops. In addition, the customary rules of humanitarian law, based on established state practice, bind all parties to an armed conflict, whether states or non-state armed groups. International humanitarian law provides protections to civilians and other noncombatants, from the hazards of armed conflict. It addresses the conduct of hostilities - the means and methods of warfare - by all sides to a conflict. Foremost is the rule that parties to a conflict must distinguish at all times between combatants and civilians. Civilians may never be the deliberate target of attacks. As discussed below, warring parties are required to take all feasible precautions to minimize harm to civilians and civilian objects and to refrain from attacks that fail to discriminate between combatants and civilians, or would cause disproportionate harm to the civilian population. Common Article 3 provides a number of fundamental protections for civilians and persons who are no longer taking part in hostilities, such as captured combatants, and those who have surrendered or are unable to fight because of wounds or illness. It prohibits violence against such persons - particularly murder, cruel treatment, and torture - as well as outrages against their personal dignity and degrading or humiliating treatment. The Fourth Geneva Convention (and the Hague Regulations of 1907) on the law of occupation address such issues as humanitarian access and the detention of civilians for security reasons. As noted, Human Rights Watch considers the situation in Gaza to continue to be an occupation, despite the pullout of Israeli forces and settlers in 2005, because Israel still exercises control over Gaza's airspace, sea space, and land borders, as well as its electricity, water, sewage, and telecommunications networks and population registry. International humanitarian law limits permissible means and methods of warfare by parties to an armed conflict and requires them to respect and protect civilians and captured combatants. The fundamental tenets of this law are "civilian immunity" and the principle of "distinction." While humanitarian law recognizes that some civilian casualties are inevitable during armed conflict, it imposes a duty on warring parties at all times to distinguish between combatants and civilians, and to target only combatants and other military objectives. Civilians lose their immunity from attack when and only for such time as they are directly participating in hostilities. Humanitarian law also protects civilian objects, which are defined as anything not considered a military objective. Prohibited are direct attacks against civilian objects, such as homes and apartments, places of worship, hospitals, schools, and cultural monuments - unless they are being used for military purposes. Civilian objects become subject to legitimate attack when they become military objectives - that is, when they are making an effective contribution to military action and their destruction, capture, or neutralization offers a definite military advantage. This would include the deployment of military forces in what are normally civilian objects. Where there is doubt about the nature of an object, it must be presumed to be civilian. Humanitarian law prohibits indiscriminate attacks. Indiscriminate attacks are of a nature to strike military objectives and civilians or civilian objects without distinction. Examples of indiscriminate attacks are those that are not directed at a specific military objective or that use weapons that cannot be directed at a specific military objective. Prohibited indiscriminate attacks include area bombardment, which are attacks by artillery or other means that treat as a single military objective a number of clearly separated and distinct military objectives located in an area containing a concentration of civilians and civilian objects. Gaza is one of the most densely populated areas in the world. International humanitarian law does not prohibit fighting in urban areas, although the presence of many civilians places greater obligations on warring parties to take steps to minimize harm to civilians. Humanitarian law requires that the parties to a conflict take constant care during military operations to spare the civilian population and to "take all feasible precautions" to avoid or minimize the incidental loss of civilian life and damage to civilian objects. These precautions include doing everything feasible to verify that the objects of attack are military objectives and not civilians or civilian objects, and giving "effective advance warning" of attacks when circumstances permit. Forces deployed in populated areas must avoid locating military objectives near densely populated areas, and endeavor to remove civilians from the vicinity of military objectives. Belligerents are prohibited from using civilians to shield military objectives or operations from attack. "Shielding" refers to purposefully using the presence of civilians to render military forces or areas immune from attack. Taking over a family's home and not permitting the family to leave for safety so as to deter the enemy from attacking is a simple example of using "human shields." At the same time, the attacking party is not relieved from its obligation to take into account the risk to civilians simply because it considers the defending party responsible for having located legitimate military targets within or near populated areas. That is, the presence of a Hamas commander or military facility in a populated area would not justify attacking the area without regard to the threatened civilian population. Since the beginning of the Israeli air offensive on December 27, 2008, Israel has issued purported warnings of attacks to the civilian population in Gaza. These have taken the form of flyers dropped from fighter jets and messages conveyed by telephone. 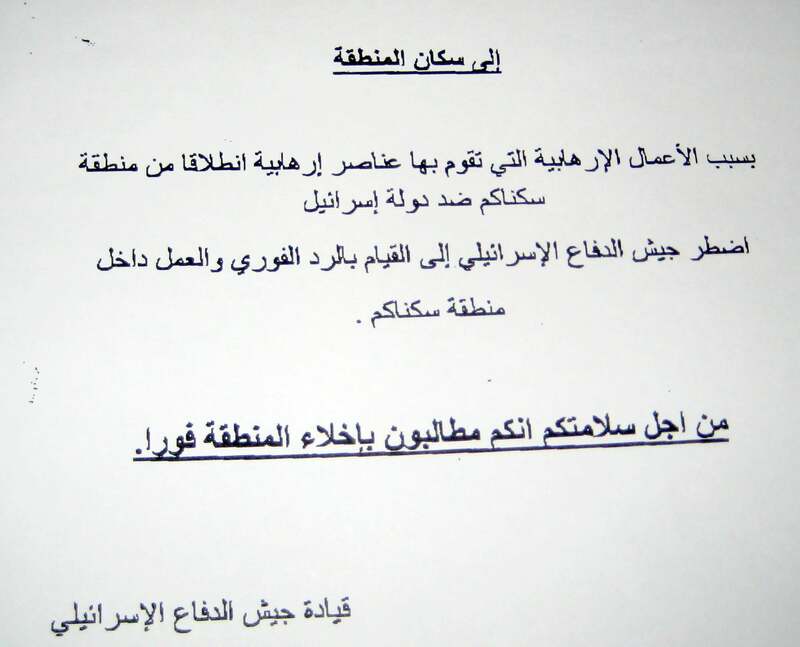 The flyers addressed to "Inhabitants of the Area" from IDF Command, state that "For the sake of your safety you are asked to evacuate the area immediately." Telephone warnings, either from a live caller addressing the recipient by name or a pre-recorded message, inform Gaza residents that they should leave their homes because there has been "terrorist activity" in the area. International humanitarian law requires, so long as circumstances permit, that warring parties give "effective advance warning" of attacks that may affect the civilian population. What constitutes an "effective" warning will depend on the circumstances. Such an assessment would take into account the timing of the warning and the ability of the civilians to leave the area. The Israeli warnings to date appear to be too general - providing no specific information on time or place -- to be considered "effective." Civilians who do not evacuate following warnings are still fully protected by international law. Otherwise, warring parties could use warnings to cause forced displacement, threatening civilians with deliberate harm if they did not heed them. So, even after warnings have been given, attacking forces must still take all feasible precautions to avoid loss of civilian life and property. This includes canceling an attack when it becomes apparent that the target is civilian or that the civilian loss would be disproportionate to the expected military gain. International humanitarian law also prohibits "acts or threats of violence the primary purpose of which is to spread terror among the civilian population." Statements calling for the evacuation of areas that are not genuine warnings, but are primarily intended to cause panic among residents or compel them to leave their homes for reasons other than their safety, would fall under this prohibition. This prohibition does not attempt to address the effects of lawful attacks, which ordinarily cause fear, but rather those threats or attacks on civilians that have this specific purpose. Israel has launched repeated attacks on police stations in Gaza, killing and injuring large numbers of police. The legality of such attacks depends on a number of factors; it is incorrect to assert that police and police stations in Gaza are automatically valid military targets. Under international humanitarian law, police are presumed to be civilian - and thus immune from attack - unless formally incorporated into the armed forces of a party to a conflict or directly participating in the hostilities. Thus, police only engaged in ordinary police roles, such as regulating traffic or ordinary law enforcement, would not be subject to lawful attack, while those who are Hamas fighters can be targeted. Police who engage in both ordinary law enforcement and at times in fighting would, like other civilians, be subject to attack whenever and for such time as they were actively participating in the hostilities. Police stations are presumptively civilian objects. However, if a police station is being used for military purposes, such as a Hamas military headquarters or a place to store weapons for use in fighting, that station could be subject to lawful attack. Such attacks in any case must not cause disproportionate civilian loss, and so must factor in any reasonably anticipated harm to police or others who are not participating in the hostilities. Without further research on the ground, it is not yet possible to determine whether the police stations struck by Israel served any military purpose, and were therefore legitimate objects of attack. Mosques, like all houses of worship, are presumptively civilian objects that may not be attacked unless they are being used for military purposes, such as a military headquarters or a location for storing weapons and ammunition. All sides must take special care in military operations to avoid damage to houses of worship and other cultural property. As parties to the armed conflict, Hamas and other Palestinian armed groups have an obligation to abide by international humanitarian law. The targeting of military installations and other military objectives is permitted, but Hamas must take all feasible precautions to avoid civilian harm and is prohibited from targeting civilians, or launching indiscriminate attacks or attacks that would cause disproportionate harm to civilians compared to the expected military advantage. Hamas commanders must choose such means of attack that it can direct at military targets and minimize incidental harm to civilians. If the weapons it uses are so inaccurate that it cannot direct them at military targets without imposing a substantial risk of civilian harm, then it should not deploy them. Deliberately attacking civilians is in all circumstances prohibited. The rockets fired by Hamas - locally made Qassam rockets and some more advanced Russian-designed "Grad" rockets - are considered to be so inaccurate as to be incapable of being aimed in a manner to discriminate between military targets and civilian objects, at least when, as has been the case, they are targeting populated areas. Statements from Hamas officials indicate that they are directing their rockets at Israeli population centers. The use of such rockets against civilian areas violates the prohibition on deliberate and indiscriminate attacks. Likewise, a party that launches rockets from populated areas - thus making civilians vulnerable to counterattacks - violates the requirement to take all feasible precautions to protect civilians under its control against the effects of attacks. International humanitarian law allows the targeting of military commanders in the course of armed conflict, provided that such attacks otherwise comply with the laws that protect civilians. Normally, political leaders, as civilians, would not be legitimate targets of attack. The only exception to this rule is if their role includes commanding troops, planning attacks or otherwise directly participating in hostilities, during which time they become subject to lawful attack. According to the International Committee of the Red Cross, direct participation in hostilities means "acts of war which by their nature and purpose are likely to cause actual harm to the personnel and equipment of enemy armed forces," and includes acts of defense. Thus, Hamas political leaders who are commanding belligerent forces would be legitimate targets. However, merely being a Hamas leader does not in itself make an individual lawfully subject to military attack. In principle, it is permitted to target the location where a combatant resides or works. However, as with any attack on an otherwise legitimate military target, the attacking force must refrain from attack if it would disproportionately harm the civilian population or be launched in a way that fails to discriminate between combatants and civilians. Purusant to its duty to take all feasible precautions to avoid civilian harm, the attacking force should also consider whether there may be alternative sites where the combatant can be targeted without endangering civilians. Military attacks on broadcast facilities used for military communications are legitimate under international humanitarian law, but such attacks on civilian television or radio stations are prohibited if they are designed primarily to undermine civilian morale or to psychologically harass the civilian population. Civilian television and radio stations are legitimate targets only if they meet the criteria for a legitimate military objective; that is, if they are used in a way that makes an "effective contribution to military action" and their destruction in the circumstances ruling at the time offers "a definite military advantage." Specifically, Hamas-operated civilian broadcast facilities could become military targets if, for example, they are used to send military orders or otherwise concretely to advance Hamas's armed campaign against Israel. However, civilian broadcasting facilities are not rendered legitimate military targets simply because they spout pro-Hamas or anti-Israel propaganda. Just as it is unlawful to attack the civilian population to lower its morale, it is unlawful to attack facilities that merely shape civilian opinion; neither directly contributes to military operations. Should stations become legitimate military objectives because of their use to transmit military communications, the principle of proportionality in attack must still be respected. This means that Israeli forces should verify at all times that the risks to the civilian population in undertaking any such attack do not outweigh the anticipated military benefit. They should take special precautions in relation to buildings located in urban areas, including giving advance warning of an attack whenever possible. Under international humanitarian law, Israel remains the occupying power in Gaza even though it withdrew its permanent military forces and settlers in 2005, because it continues to exercise effective day-to-day control over most aspects of Gaza life. As noted, in addition to its effective control over Gaza's land, air, and sea borders, Israel controls most of the territory's electricity, water, and sewage capacity, and its telecommunications networks and population registry. Israel's continuing blockade of the Gaza Strip, a measure that is depriving its population of food, fuel, and basic services, constitutes a form of collective punishment in violation of international humanitarian law. Under international humanitarian law, parties to a conflict must allow and facilitate the rapid and unimpeded passage of impartially distributed humanitarian aid to the population in need. The belligerent parties must consent to allowing relief operations to take place and may not refuse such consent on arbitrary grounds. They can take steps to control the content and delivery of humanitarian aid, such as to ensure that consignments do not include weapons. However, deliberately impeding relief supplies is prohibited. In addition, international humanitarian law requires that belligerent parties ensure the freedom of movement of humanitarian relief personnel essential to the exercise of their functions. This movement can be restricted only temporarily for reasons of imperative military necessity. Serious violations of international humanitarian law that are committed with criminal intent are war crimes. War crimes, listed in the "grave breaches" provisions of the Geneva Conventions and as customary law in the International Criminal Court statute and other sources, include a wide array of offenses, including deliberate, indiscriminate, and disproportionate attacks harming civilians, hostage taking, using human shields, and imposing collective punishments, among others. Individuals also may be held criminally liable for attempting to commit a war crime, as well as assisting in, facilitating, aiding or abetting a war crime. Responsibility also may fall on persons planning or instigating the commission of a war crime. Commanders and civilian leaders may be prosecuted for war crimes as a matter of command responsibility when they knew or should have known about the commission of war crimes and took insufficient measures to prevent them or punish those responsible. States have an obligation to investigate and fairly prosecute individuals within their territory implicated in war crimes.